Our final day in Barcelona was the day of Matt’s thirtieth birthday. As it was a day of celebrations I had booked us a table at one of the finest restaurants in Barcelona; Informal By Marc Gascons at The Serras Hotel. 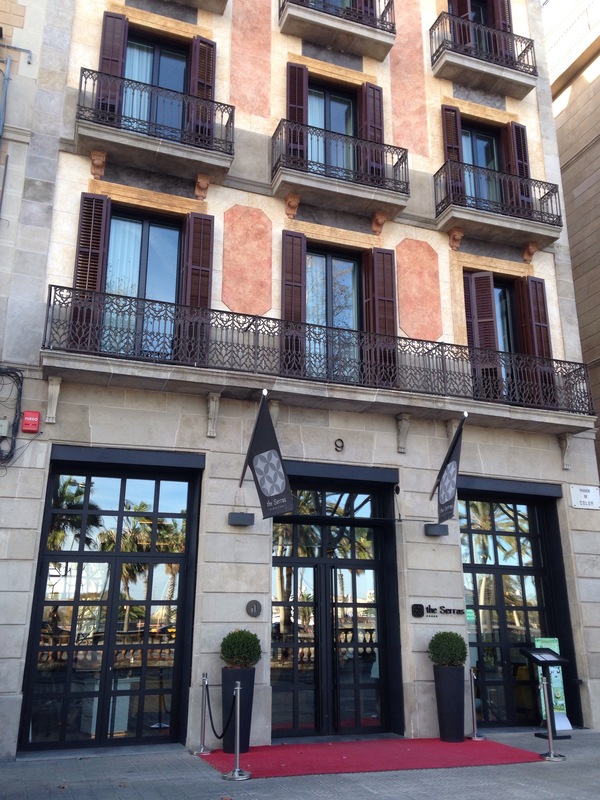 Informal Restaurant is ran by Michelin-starred chef Marc Gascons in the 5 starred Serras Hotel overlooking the port in Barcelona. The restaurant is small, as is the open kitchen with just twenty people making up the team. Together they create a seasonal menu using the finest fresh produce. As Matt and I are quite the foodies, I knew that an unforgettable meal would be a great way to celebrate his thirtieth birthday. Before our trip I spent hours searching online to choose a restaurant and I’m so thankful that I booked Informal. I booked our table for 2pm, so we spent a few hours before the meal enjoying celebratory drinks. We even popped up to the gorgeous roof terrace at The Serras hotel to take in the beautiful view over the port. Come 2pm we headed down to the restaurant and were shown to our table. The interior is beautiful, comfy chairs and benches to sit on, an open kitchen and modern art adorning the walls. We were offered drinks upon arrival and were talked through the menu. The prices although reflected the quality of the restaurant and food were very reasonable. We chose the special tasting menu which was priced at €45 per person. What we didn’t realise until the waitress kindly pointed out that the taster menu wasn’t one starter one main and a dessert as we had thought. The taster menu was ALL the starters, plus a main, dessert and bottle of wine! As per Spanish dining the starters were brought to our table as and when they were ready. We were brought; Toasted flat bread with tomato and extra virgin olive oil; Salted anchovies from L´Escala with olive oil and pepper; Patatas bravas by informal; Baby broad bean salad, peas, green beans, mint, Jabugo ham and truffle oil; Salmon tartar, avocado, vegetables, wasabi and tobiko; Roast beef flatbread seasoned with parmesan cheese and black truffle oil and Free-range chicken roast croquettes. Above you can see the Salmon tartar, the Baby broad bean salad, the croquettes and a little of the toasted flat bread. All the starters were incredible! From the delicately put together broad bean salad decorated with the finest flowers, to the crispy but fluffy patatas bravas and the melt in the mouth croquettes. However the standout for us was the Roast beef flatbread seasoned with parmesan cheese and black truffle oil. This has to be the most incredible thing I have ever tasted. The combination of the crispy flatbread, the melt in your mouth beef, the salty parmesan and sweet truffle oil was divine! I could of eaten a million and one of these! The array of starters seemed like they were never ending however we didn’t mind. We had all afternoon! They say all good things come to an end and so did the starters. We had time to sit back relax and enjoy our wine while our mains were prepared. Matt chose the Roasted monkfish casserole, potatoes, onions, tomatoes, bacon, tender garlic and black olives and I chose the Vegetables risotto, artichokes, asparagus, spinach and parmesan cheese. Although both dishes were fairly simple in creation, the flavours, the quality of the produce and the craftsmanship of the dish made them so much more special. My risotto was rich and creamy, filled with flavour and not stodgy like many risottos in lesser restaurants. After dinner we were left to enjoy our wine and peruse the desserts we could choose from. As we were on the taster menu the choices were limited to assorted icecreams or the Chocolate and toffee semifredo with banana nougat and lime. We both, of course, went for the semifreddo! It arrived like a piece of art looking impressive and delicate all at the same time. Our waitress explained what each of the components of the dessert were and advised that we ensure we get a mouthful of each of the part to get the most out of the dish. Again we were very impressed, this dish was simple yet creative all in one. Three hours later, with our bellies filled with some of the finest food we’ve tasted we were ready to leave. Informal has to be one of the finest restaurants in Barcelona and definitely one of the best I’ve ever visited. I wish I was back there right now! Have you ever dined in a Michelin-starred standard restaurant? How did you find the menu? Impressive or intimidating?